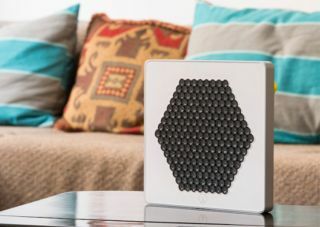 The Akoustic Arts ‘A’ is a speaker that only you can hear | What Hi-Fi? French company Akoustic Arts has come up with a clever way of listening to your music without bothering anyone else. It's come up with the ‘A’ speaker, which works in a slightly different way to your standard loudspeaker. Akoustic claims it’s the “world's most advanced directional speaker” - it creates a narrow beam of sound that focuses on a very precise area. So precise in fact, that it allows only someone sat directly in the speaker’s line of sight to hear the sound. Akoustic Arts claims that those sat outside won’t be able to hear a thing. Think of the speaker as working like a torch, except it’s firing out sound instead of light. The ‘A’ is available in two sizes: Original and Junior. There’s no Bluetooth connectivity - instead, each speaker connects to external kit via a simple 3.5mm socket. It’s set to go on sale in September 2016 and has already soared past its $30,000 Indiegogo target with more than two weeks to spare. If you’re interested in pre-ordering, the Junior costs $350 (£244) while the larger, Original version will set you back $550 (£383).